There aren't enough food, service, value or atmosphere ratings for Millie's Hot Dogs, North Carolina yet. Be one of the first to write a review! Unorganized , food is fair. Prices are ok. Service is,slow. Construction was going on inside. Hot dogs were fair. I was introduced to this place by co workers. Never thought it would be good but it was. I like the fried hotdogs. They have plate also. These people know how to cook. Take out only. 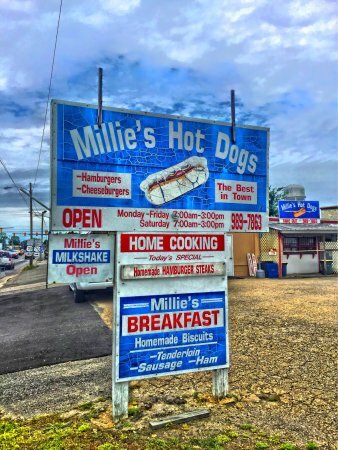 Get quick answers from Millie's Hot Dogs staff and past visitors.